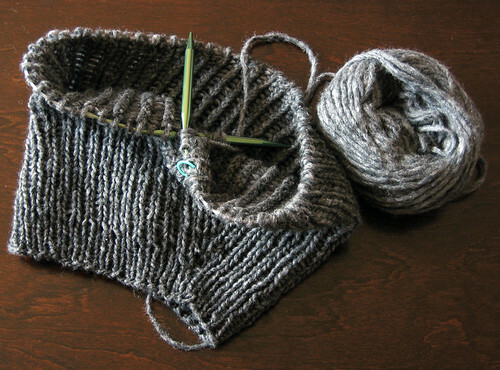 My current project underway: a knitted slouchy hat for myself. Yes, I'm back on the knitting front. I decided to take a mini break from crochet and try my hand at knitting again. I think it's more for the fact that I need to get use to, and get comfortable with knitting again as I have a few upcoming projects planned that involve knitting. I thought this project would be a nice, mindless one, something that I don't have to concentrate too much on. Or so I thought! I ended up frogging this project several times cause I'm a tight knitter, and cause my head is much fatter than I thought it was. I originally started this project a year ago, but left it unfinished when I realized halfway through that the hat was not going to fit my basketball sized head. I'm not experienced enough to know how to make the pattern bigger, since it only offered the one size for women but obviously my head is not a "normal" size for females. So I got lazy and never picked up the project again. I discovered the project a few weeks ago and decided this is the year to finished unfinished projects, and went back to the Beehive to get the male version of the pattern. I'm now halfway finished and I think it's going to fit my massive head! Woot woot! I'm hoping to finish the hat in a few days so that I can move onto my next project. Yay! Sorry, I would post a link to the pattern, if that's what you mean, but the pattern is not in Ravelry. I think the pattern was either made by one of the workers at my LYS or was a very old leaflet that someone had re-typed up. It was a pattern that I had gotten for free at the same LYS. Sorry!